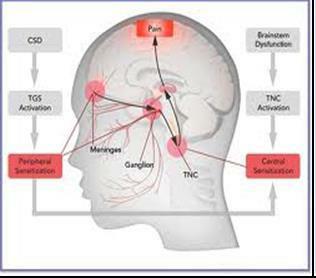 Chronic pain states can lead to neural sensitisation and centralisation. This complex condition results in decreased patient responsiveness to the usual treatments implemented for musculoskeletal pain and injury. Pain is an output of the brain, NOT AN INPUT! Pain is only one of many outputs of the brain that combine to defend us, heal us and allow us to perform. Tissue damage, pain and pathology do not usually correlate. Pain depends on how much DANGER your brain THINKS you are in. Pain is a protector, not an offender. Education and movement are the best liberators of pain. Central sensitization also occurs with chronic spinal injury, and in these cases, if conservative physiotherapy management is not relieving the pain, the assistance of pain management (facet joint injections, nerve sleeve blocks, epidurals etc) may be necessary. You may also be aware that in extreme cases, spinal stimulators are implanted to try to block the continuing abnormal efferent input influencing the perception of pain. These can be very effective in relieving pain in patients where the usual pain management techniques have failed. Chronic pain patients can also benefit from psychological counselling from a specialised pain management psychologist. Techniques to improve coping mechanisms and pacing are introduced, together with cognitive behavioural therapy. The STEPS program at the Fremantle Pain Clinic has had significant success educating people with chronic pain and significantly reducing their symptoms and improving their function. Understanding the condition and thinking differently about pain can reduce pain and allow the patient to return to normal activities. Your Move Well Physio can refer you directly to this service. With these patients, physiotherapy treatment of the central structures related to the appropriate neural pathways is necessary. For example, neural mobilisations of the brachial plexus can be of assistance in settling chronic elbow pain (tennis or golfers elbow), and straight leg raise stretches combined with lumbar rotations can assist in the treatment of chronic Achilles Tendonitis or RSD of the lower leg. Specific home or gym based exercises are also prescribed, and self-management is encouraged.